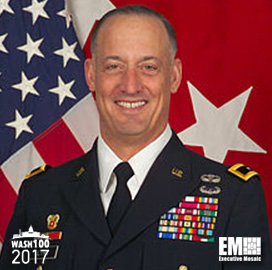 Executive Mosaic is honored to announce U.S. Army Lt. Gen. Alan Lynn, Defense Information Systems Agency director, as an inductee into the 2017 edition of the Wash100 — Executive Mosaic’s annual selection of the most influential voices in the government contracting arena. As DISA director, Lynn leads military and civilian personnel tasked to deliver, develop, plan and operate joint, interoperable and C2 capacities as well as a global enterprise infrastructure that offers assistance to the President, secretary of defense, Joint Chiefs of Staff, combatant commanders and DoD components. He also holds the title of commander of the Joint Force Headquarters – Department of Defense Information Networks and oversees defensive cyberspace activities that focus on the unity of command and unity of effort within the DoD as commander of the Joint Force Headquarters – DODIN. Under Lynn’s leadership, DISA collaborated with Boeing to develop the Boeing Black mobile device designed to help military commanders receive and transmit “top-secret” messages with the help of virtual private networks and mobile device management platforms. Lynn has also requested assistance from industry collaborators to help boost the military’s cyber defense posture with the development of assured identity, big data analytics, encryption and software defined networking tools. Lynn has held multiple leadership roles with DISA since he joined the organization in 2007 such as chief of staff, vice director, commander of the Army Network Enterprise Technical Command, commanding general of the Signal Center of Excellence and commander of the 311th Signal Command. Executive Mosaic congratulates Alan Lynn and the DISA team for his selection to receive this award.